BiologicVET is designed for your dog and cat’s health, comfort and wellness. Our products are driven by a sincere passion for animal wellness that puts quality, integrity and results before promotion. We research, manufacture and distribute all of our own products, guaranteeing superior quality and excellence. Your dog and cat have a unique biologic makeup that requires specific ratios and proportions of essential vitamins and nutrients. As a result, each BiologicVET product has been designed in precise proportions to meet their requirements. We are committed to providing nutritional supplements that are rich in quality vitamins, minerals, digestive enzymes and antioxidants that ensure your pet receives complete nutrition and nourishment. BioJOINT is a cohesive blend of ingredients, designed to help activate the chondrocytes (worker cells of the cartilage), and support their effective use of glucosamine in the rebuilding of collagen. Without this activation, glucosamine serves as an antiinflammatory agent without effectively contributing to tissue regeneration. What Sets BioJOINT Apart From Competing Joint Products? When it comes to joint supplements for dogs there is a lot of choice. For the most part they all look fairly similar using glucosamine, chondroitin and MSM with variations of quantities and other added ingredients, not to mention the treats and food that seem to be laced with similar ingredients. When you put these ingredients into a food or press it into a treat the process of blending the active ingredients with the binders and food ingredients make it more difficult for the dog to extract the ingredient from the binders. This is a similar situation when you compress these into a tablet using binders. BioJOINT does not use any binders, artificial colours or preservatives in a certified organic free-form powder base allowing for better absorption and bioavailability. So What Sets BioJoint Apart From Other Joint Products? What sets BioJOINT apart is the, the manufacturing process, the ingredients and the delivery system. We manufacture our own products so that we have complete control over every ingredient that goes into BiologicVET products. Our Canadian manufacturing facility located in Maple Ridge, British Columbia is certified by Health Canada in accordance with Good Manufacturing Practices (GMP). Using the same care and diligence used to make products fit for human consumption, we test every raw material for purity before allowing it in our products. This means that what is on the label is in the bottle until the expiry date. Our formulas are more than the normal ingredients typically used in joint formulas and are evenly proportioned according to body weight. Every serving per 20 lb of dog weight has 200mg of two types of glucosamine (hydrochloride and sulphate), 200mg of MSM (methylsulfonylmethane), Vitamin C 95mg, Chondroitin 80mg, Bromelain 60mg, Bosweillia serrata 50mg, Grapeseed extract 10mg, Manganese citrate .5 mcg and Vitamin D3 .75mcg. This cohesive blend of ingredients is designed to help activate the chondrocytes ( the worker cells of the cartilage) and to support your pet’s effective use of glucosamine in the rebuilding of collagen. BioJOINT supports healthy joint mobility & flexibility for dogs and cats showing signs of joint discomfort, stiffness, swelling or tenderness. Is It True That BioJOINT Also Supports Better Digestion For My Dog? How? Yes! The delivery system is a certified organic base of defatted flax, sunflower and sesame seed providing the good bacteria in the intestinal tract of the dog a great prebiotic food source to improve the dog’s immune system. This fiber also supplies plant estrogens called lignans that the good bacteria convert into mammalian estrogens balancing hormone function in the dog especially when a dog has been spayed or neutered. Each scoop (1 tbsp) will provide at least 20mg of lignans, enough for the Vet recommended amount of 1 mg of lignan per lb of dog weight. By improving the intestinal tract function, immune system, and hormonal function of the dog there is better absorption of the nutrients from the formula and the food the dog is eating allowing the BioJOINT formula begin to work in a very short time. So BioJOINT Helps My Dog With More Than Just His or Her Joints? That's right! BioJOINT is far more than a joint formula for reducing inflammation but a formula to support the rebuilding of collagen, as well as support the immune system and balance hormonal function to maximize their quality of life and help your pet achieve their ideal body condition and comfort. Is It True That The Average Shelf life Of Biologic Vet Products Is 3 Years? What Does That Mean? BiologicVET products have a 3 year shelf life from the date of manufacture, meaning that the ingredients and quantities of what is printed on the label is in the bottle until the expiry date. In order to accomplish this the formula must be built to maintain these levels, so no matter if you are using it when it is first made or picking up a bottle from a retailer that has had it on their shelf for a while the potency of the product is still as effective. This is our commitment to quality. Good Manufacturing Practices (GMP) Certified We manufacture our own products so that we have complete control over every ingredient that goes into BiologicVET products. Our Canadian manufacturing facility located in Maple Ridge, British Columbia is certified by Health Canada in accordance with Good Manufacturing Practices (GMP). Using the same care and diligence used to make products fit for human consumption, we test every raw material for purity before allowing it in our products. 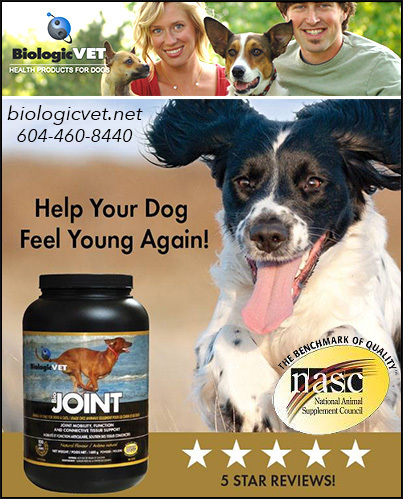 National Animal Supplement Council (NASC) Certifies All Ingredients in BioJOINT! BiologicVET products carry the National Animal Supplement Council’s seal of approval. This recognition is given to companies that pass an audit process and manufacturing quality protocols. This independent organization evaluates the ingredient, label and health claims so you can make informed decisions about your pet’s health. ALSO: Low Risk Veterinary Health Products (LRVHP) BiologicVET has met conditions established by Health Canada and has been issued unique product-specific LRVHP notification numbers. LRVHP ensures that only approved and safe ingredients are used in the products. Your dog needs healthy joints to maintain an active, happy lifestyle. We would love to hear from you about your dogs and invite you to call us and tell us more! We have many of our products on AMAZON for your convenience.